While not as fancy as some of Micky's OCMD projects, this looks interesting. While I do wonder how it would work with a VTR reflector, it does has some good reviews. Last edited by 8541Hawk; 05-27-2015 at 11:17 AM. You may want to check that link Mike, it doesn't seem to work on my end. I have been watching this for a while. The new improved version looks to be a better fit. From what I.ve read there is some issue with the cutoff of the beam. I just installed the Speedmetal LED conversion I got at Cycle Gear (http://www.cyclegear.com/SPEEDMETAL-LED-Conversion-Kit) and my thoughts are similar to those of E. Marquez on the one he installed a year or so ago--better than a stock bulb, but not really enough reach on high beam to satisfy me. The pattern is somewhat strange. I'll give it more time before final judgement. Here is the correct link for the bulb in the OP. Last edited by killer5280; 05-27-2015 at 11:17 AM. I just installed the Speedmetal LED conversion I got at Cycle Gear (SPEEDMETAL - LED Conversion Kit - Headlights - Electrical - Parts - Cycle Gear) and my thoughts are similar to those of E. Marquez on the one he installed a year or so ago--better than a stock bulb, but not really enough reach on high beam to satisfy me. The pattern is somewhat strange. I'll give it more time before final judgement. I tried 4 different LED drop in "bulbs"
Useable light at distance was the common failure in all. As I have LED off road lights that are designed around the emitter which punch holes in the dark at distance, clearly the issue is not the LED, but in how it is focused .. Drop ins just don't work. Im not at all satisfied with HID projectors in the single tube drop down cut off or servo lens either. The cut off works great for a car... but horrible in a light housing that leans over. Im going to modify the shade in mine to see if i can alter the shape of the patterns a bit but likely it will make it useable on the street as the light will spill over to oncoming car lanes. Im pretty sure for now.. a OEM housing that has purpose designed LED lights grafted in or H4 80/130 bulbs in a stock housing and add some 3" LED lights for fill and distance is the way Im going. Got any links to products in this regard? I did some cursory searching around and found some likely, albeit pricy, items. The 55 watt H1 headlights in my car would be more than adequate on my bike, so I know it comes down to focus. Im using one similar to this on my bike currently. Like E.marquez says.....The cutoff is the main issue. As far as an improvement over a standard H4 its a monster improvement. Just not perfect. I've tried three different configuration LED H4 bulbs 2 fan cooled and 1 wick cooled. All with different type LEDs. I found what a lot of you found. The cut-off and the distance throw is just not there as opposed to a quality Halogen. They do, however, seam to attract significant attention from other drivers around town. That is a good thing. And, they look kinda cool. I just ordered this from Cyclops as the original one I bought from them - different set up though, got damaged from a slow get off by me. I should have it Tuesday. And the original 1 worked great. Awesome light compared to stock. It does look very bright but very cut off compared to the halogens. Any word on lifespan? I tend to be wary of new unproven tech in durability. Was this on another bike ? If so, how long have you been using it ? No matter what, I'm very interested in this, so, let us know how well this works on the Hawk. I have had the Cycle Gear LED for a few months now. It is quite a bit better than the halogen H4 stock bulb on low beam and it's only 2400 lumens or so, so the Cyclops is likely much better than stock. High beam is OK, but it doesn't project a beam of light far downrange like I would like. 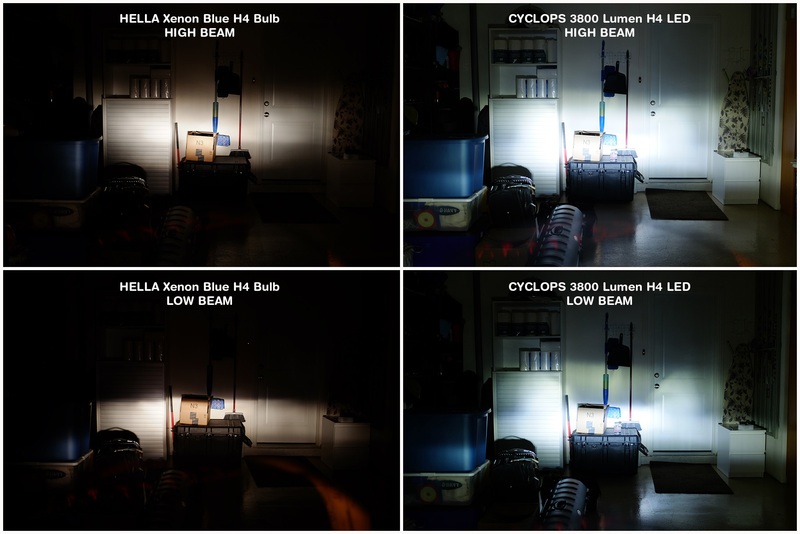 Overall I'm happy with the Cycle Gear bulb and I think it's better than halogen in spite of the high beam cutoff, but I wish I had gotten the Cyclops product. I had it for the last year - no problem, until I had my slow get off - the fan housing on the bulb got crunched so it doesn't work. Am I missing it or what is the real test results of the Cyclops vs the stocker? Is it a great overall improvement? Joe, nnj has already answered your question. Killer in post #14 also references the Cycle Gear LED light as being an improvement. I should think if you order the Cyclops, you're safe. I know I will be doing so shortly. Enter coupon code "ADV" to save a little bit of $ on Cyclops site, if anyone orders 1. Ah, ok flash thanks. I was just seeing the posts on the cycle gear one but that one is way less lumens. Putting this light on the long list of stuff I want to mod. In case any of you are still on the fence, I received my Cyclops 3800 Lumen LED build today. images below cannot do it justice. I took a quick ride around town and my man parts fluttered. SUCH an amazing upgrade to the light. Fall off was not as bad as I had read (for me) and no one flashed me (yet) I'll try to update ya's after I ride her in daily traffic- my Hawk is my DD throughout LA. Last edited by mfalco248; 11-12-2015 at 07:39 PM. Sorry about that Ren, fixed!! Wow thats stunning. My problem is on tightish turns in the country you cant see round the turn. This looks to solve that. I also received mine a few eeks ago. Thanks to VTR1000F(Steve) for helping me with shipping. I took some pics of my install, since there are a few things to look into, it's not just a straight swap. The fan portion gets in the way of the retaining clip, and the rubber boot. So, you do need to play with it to get the clip on, and, it requires cutting out the rubber boot. There is a BIG difference from my 100w bulb I previously had. Unfortunately, riding season up here has pretty much ended for me, but, I still got a chance to take the bike out in the street, and see the difference. Last edited by Jack Flash; 11-13-2015 at 05:22 PM. 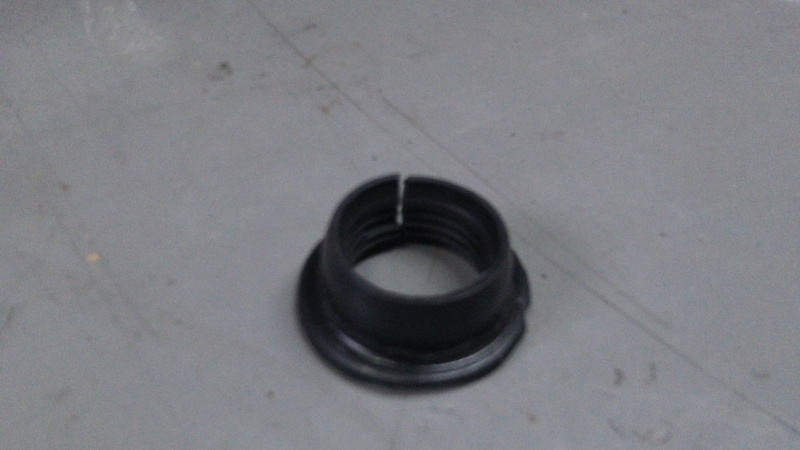 The first picture shows what you need to remove off the rubber boot in order to fit it over the light. Second and third pictures show end result. What I really like about this light is it's white. Very white. You see where you're going no doubt. I also like the fact, when you put the high beams on, it doesn't shut the low beams on to put the highs. The low stays on, and there is a second light that opens for the high beams. The advantage is you don't lose the low light pattern at the expense of the highs. You also eliminate the shut off time between the lows and highs. 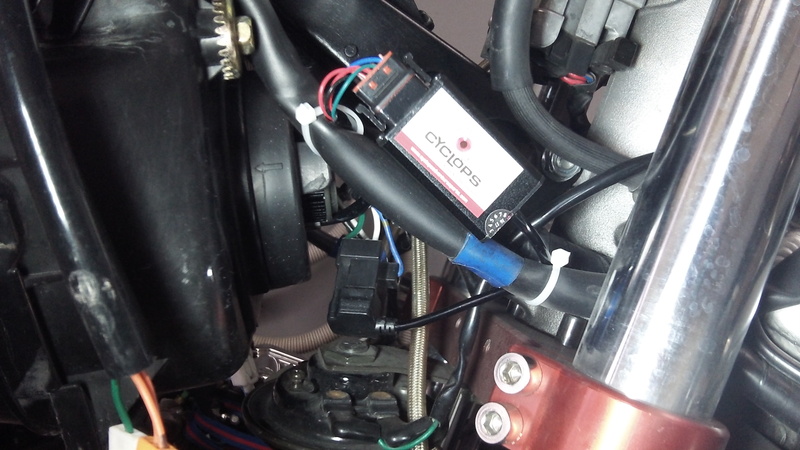 I've also installed the Cyclops into my VTR. I did not need to chop the rubber boot, but it is a tight fit. I've only been out for one decent run at night but safe to say there is a night and day difference (see what I did there?) between the stock 60/55 and the Cyclops. The latter does seem to have more spill up and to the sides on low, but no-one flashed me so it can't have been too annoying. I did spend some time aligning the low-beam cut off, and was very happy with the high beam, especially the breadth. The bulb kit included a couple of spacers which allows a little fine tuning of the emitter vs reflector distance and I may look at whether these make it better or worse; I do feel the high beam pattern could be a little more focussed than it is, but honestly there's so much more light that the more diffuse pattern isn't really an issue. Oh, I may have to pop over with a few beers and have a look. 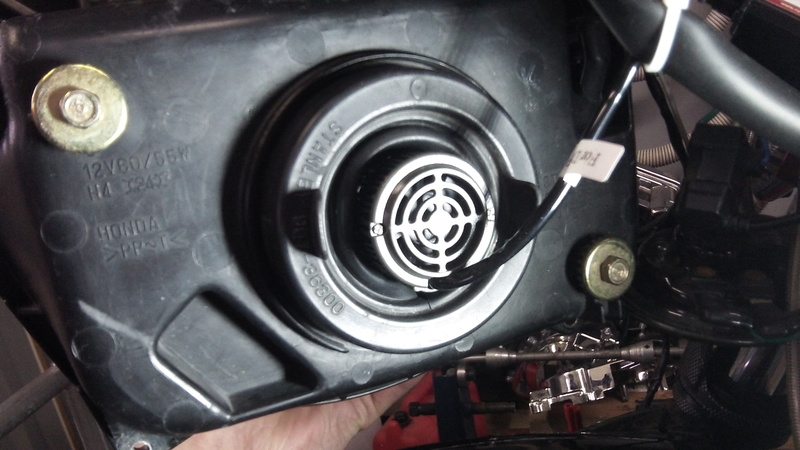 Once installed, please provide your observations on the effect the low beam cut off has with causing light "dead" spots in corners or the bike is otherwise leaned over. I decided the HID projector bi xenon was not for me for that reason... Light output and beam pattern was great on HIGH.. but low beam cut off was only nice in a straight line... leaning the bike causes a dead spot in the "low side"
will do. Prior to pulling the trigger, I did a few searches on Google and found that the comments were overwhelmingly positive from users of this kit, hence my decision to go forward.